A new Nansledan resident was thrilled to receive the keys to her new property from none other than HRH The Duke of Cornwall. 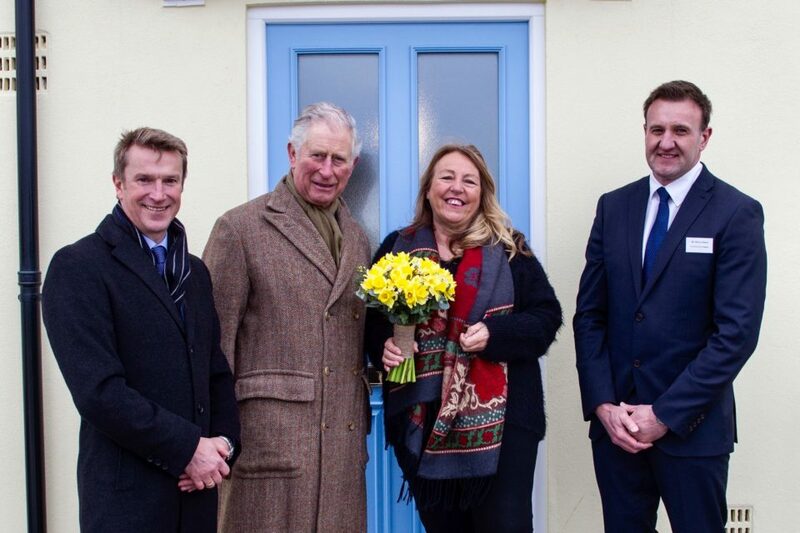 Marguerite St John was the 150th person to move into one of the new houses built at Nansledan, the Duchy of Cornwall’s extension to the seaside town of Newquay. Marguerite’s occupation of her new property coincided with a visit to Nansledan by His Royal Highness. Marguerite is pleased with the house, praising its high standards and good use of space. It was built by CG Fry & Son, one of the consortium of South West building companies who are building Nansledan, the others being Wainhomes and Morrish Builders. A real advocate of Duchy of Cornwall developments, Marguerite previously owned a CG Fry & Son-built property at Tregunnel Hill, another Duchy-led development in Newquay. She added: “I had lived in a CG Fry property before so when I decided to downsize I wanted to retain all the best aspects of my original house. Nansledan is being built on Duchy-owned land to the east of Newquay and will eventually comprise around 4,000 homes mixed with retail, offices, workshops, green spaces and a range of community facilities. Regional contractor Midas Construction recently began building work on a new 14-classroom school, Skol Nansledan, on 4.7 hectare site off Quintrell Road. It is due to open in September 2019 and will cater to around 420 children.